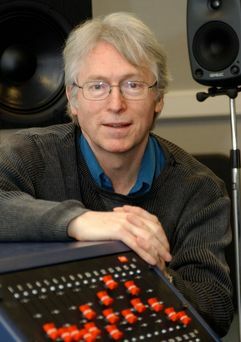 Since November 2004 Simon Emmerson has been Professor in Music Technology and Innovation at De Montfort University, Leicester, following twenty eight years as Director of the Electroacoustic Music studios at City University, London. His catalogue now spans thirty five years, including commissions for Intermodulation, Singcircle, Option Band, Lontano, Jane Manning, Philip Mead, Jane Chapman amongst many others. He has also completed purely electroacoustic commissions from the IMEB (Bourges) and the GRM (Paris). He was a first prize winner at the Bourges Electroacoustic Awards in 1985 for his work Time Past IV (soprano and tape). He contributed to and edited The Language of Electroacoustic Music in 1986 (still in print) and Music, Electronic Media and Culture (Ashgate, 2000). His book Living Electronic Music was published by Ashgate in 2007. He was founder Secretary of EMAS (The Electroacoustic Music Association of Great Britain) in 1979, and served on the Board of Sonic Arts Network from its inception until 2004. In 2008, he was invited to join the Board of Trustees of its successor organisation 'Sound and Music'. A second CD for Sargasso is in preparation. It features my more cross-cultural work. The Points Trilogy links live electronic works for harpsichord (Points of Departure - Jane Chapman) and kayagum (Points of Return - Inok Paek) through an acousmatic work (Points of Continuation). A work for baroque flute and harpsichord (Time-Space - performed by the Dawson/Chapman duo) and a recently rediscovered studio recording of Pathways (flute, cello, sitar, tablas, electronics – performed by Shiva Nova) completes the sequence. Due Spring 2008. There is also work on a chapter on live and interactive electronic works for the Handbook of Computer Music and Digital Sound Culture (edited by Roger Dean for OUP); and one on my own compositional techniques for Contemporary British Music: Technique and the Compositional Process (edited by Paul Archbold and Robert Saxton for Ashgate). New works for Jane Chapman and Kate Ryder (for harpsichord, piano and electronics); and a live electronic ‘flute quartet’ for Katrin Zenz (Athens) are also planned.